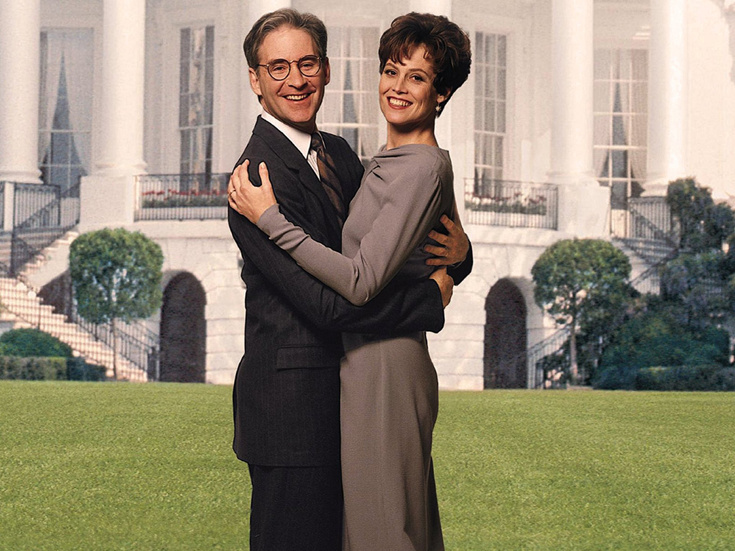 Kevin Kline & Sigourney Weaver in a promo shot for the 1993 motion picture "Dave"
The long-in-the-works musical adaptation of the 1993 White House comedy Dave has scheduled its world premiere, appropriately, in Washington, D.C. The musical will debut this summer at Arena Stage (home to the 2015 world premiere of future Tony-winning Best Musical Dear Evan Hansen). Featuring a book co-written by the late Thomas Meehan (Annie) and Nell Benjamin (Mean Girls), music by Tom Kitt (Next to Normal) and lyrics by Benjamin, the tuner will run from July 13 through August 19 at Arena's Kreeger Theater. Tina Landau (SpongeBob SquarePants) is onboard to direct. "I'm thrilled to be part of the team that will bring Dave to Arena Stage, as it's a story I've been wanting to tell, at a theater I’ve been wanting to work at (but haven't yet). And the moment for Dave is certainly now," says Landau. "The show offers a hilarious critique of our current political state of affairs and it offers a compelling love story—but more than anything for me, the show offers an invitation to hope again and believe again during times when that often feels difficult. It's a reminder of our ideals and the necessity of integrity in both our political actions and our personal relationships. It's about Dave of course—well, the Dave in all of us—an ordinary citizen who thinks he doesn't matter in the big scheme of things but comes to discover that, with his principles and his passion, he can make a difference in the world. And must. Now that's a musical for our times!" The film follows Dave Kovic, a temp-agency operator who, due to his uncanny resemblance to President of the United States Bill Mitchell, is asked to secretly stand in for him when the commander-in-chief falls into a coma. The film starred Kevin Kline, Sigourney Weaver, Frank Langella and Ben Kingsley. Casting and additional creative team members for Dave will be announced at a later date. Gear up for the musical with the film's trailer below.